Note: Key provided by Feral Interactive, porter and publisher for the Linux version. Total War: WARHAMMER II was originally developed by Creative Assembly and published by Sega. 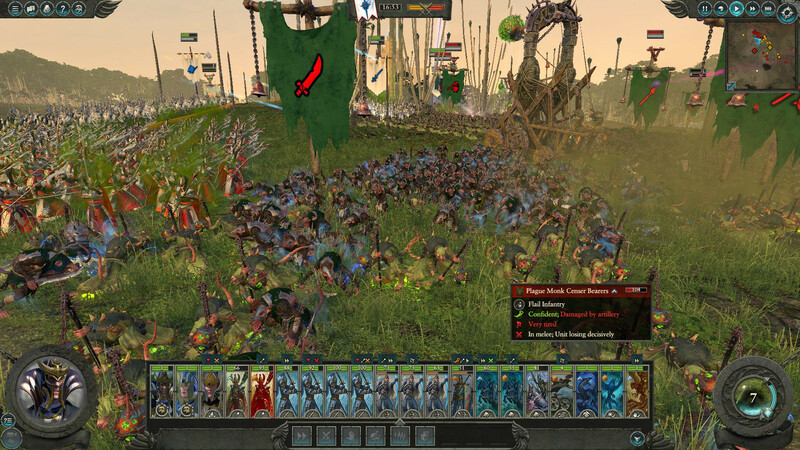 The Warhammer Fantasy setting is a great fit for the Total War series’ chaotic and messy battles. Larger-than-life units like dragons and ogres mix it up with spell casters and ranks of pristine elven units. There’s a lot to love in these engagements and it’s pleasing to watch the varied roster between the playable factions fight in jungle, plains, volcanic lands and elsewhere. The art direction as well as the sheer ridiculous nature of the factions make it satisfying to watch an armored cavalry charge scatter a disorderly throng of ratmen as they crash into their flanks. Controlling the action remains simple and easy to do and almost everything in the game is explained by either tooltips or an advisor that will guide you through the intricacies of battle. There are some omissions from previous games in the series, such as the lack of an option to have part of your army be controlled by an AI. This can make some of the larger battles something of a slog and easy to mess up as keeping track of all your units under hectic conditions can be trying. Sure, the game can be paused at any time and orders can be issued but play enough battles and you’ll see that the needless micromanagement really does add up. That doesn’t mean that the battles are tedious or dull—it’s quite the opposite. 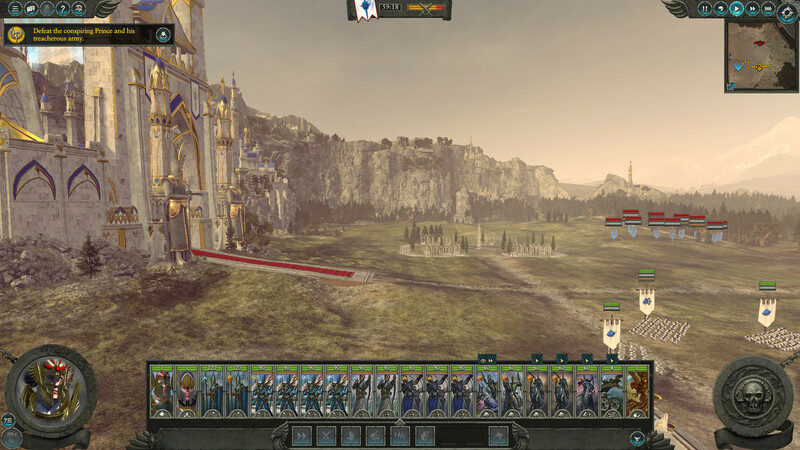 The sizeable unit roster gives you a lot of flexibility when it comes to building up your armies and shifting the force composition can mean that different tactics are needed during battle. Some factions are more inclined towards infantry, ranged units or what have you not, but it’s possible to make do with the types of units that you prefer and win. Indeed, this creates some of the more memorable situations in the game where superior tactics can rout a more powerful enemy. Naturally, a higher level commander or better-trained troops can make a significant difference as well. All in all, the amount of times that I won by a mere hairsbreadth is probably higher than I’d care to admit. Those nail-biting moments are characteristic of the game and what’s ultimately so fun about Total War-styled battles. The computer opponents haven’t really been improved much from the first Total War: WARHAMMER. They mostly feel competent, attempting to harass flanks and harry forces with missile units but haven’t yet mastered the more devious stratagems such as moving hidden units carefully through forests or counting on arriving reinforcements to threaten an army from another direction. They’ll put a good fight and are relentless but they sorely lack the unpredictable nature of a human enemy. The respectable assortment of unit rosters and factions make it less evident during a normal campaign but, given a few dozen hours, it’s clear that there’s room for improvement. Things are somewhat better on the strategic level. Historically, on the turn-based map, where players move armies and build up their settlements, the AI has been a mix of overly aggressive and strategically inept. While they’re still a little too happy to throw away armies for my tastes, their activity seems to be more focused and logical. Factions will expand and consolidate their territories and keep being competitive with the player well into the mid and late game. We’re still a ways off from having an AI that’s on equal footing with a human without getting bonuses but WARHAMMER II has at least made it feel less outright unfair than previous Total War games. It’s still a war game and the computer favors conflict but at least things like diplomacy can still provide consistent and predictable results. The shift towards giving the player clearer objectives has also helped things. Missions pop up with regularity and feel like natural extensions to what your overlying strategy should be. Whether it’s negotiating a non-aggression pact, taking a specific nearby settlement or doing a special battle to improve your legendary lord, these nudges help create a sense of direction in an otherwise large map full of factions. All throughout the myriad battles and expansion, there is a bar at the top of the campaign map that shows how far along a faction is from ultimate victory. This is tied into the story of the game, where the world is headed towards an apocalyptic confrontation centered around a magical vortex where either order or chaos will win the day. Each playable factions has a different objective here and there’s a sub game consisting of thwarting opponents that you can play simultaneously. Whenever a faction has filled their bar up to a certain point, they can conduct a ritual; other factions may send intervention forces to frustrate their plans and keep themselves ahead. This focuses more of the action in the game, making certain cities vital strategic targets that you know you’ll have to either target or defend. This is one of the better changes in WARHAMMER II, as it provides players not only with a sense of urgency, but gives all the conquest and fighting a sense of purpose other than being the biggest and baddest faction around. Systems like building in settlements, trade and diplomacy are streamlined to the point that there’s not much point trying to spending too much time messing about with them. There are different faction-appropriate building chains and unique per-settlement special buildings but these lose most of their meaning as players expand beyond three or so provinces. As players expand and need more armies to keep all of their new land, it makes more sense to keep only a few provinces fully-geared towards military production and dedicate most building slots towards the income-generating buildings that will pay for the large unit upkeep. While I’m fine with the system, generally, I still wish there was more depth to its parts. The branching building chains, with varying bonuses, from other Total War titles were a simple thing that made me care more about keeping regions happy and well-defended. With all that said, there is still variety in how factions actually feel. The insidious Skaven, for example, are keen on ambushing and their settlements are built within ruins. Other factions need to keep an eye out on their corrupting influence as they can easily cause unrest and even spread plague to cities. Playing as a more diplomatic faction, like the High Elves, can mean less rapid expansion through conquest and more making other factions join your confederation while you keep away raiders and other undesirables. It’s not exactly a huge difference in the grand scheme of things but it’s enough to make different factions worth trying out. Coupled with the main storyline and bar for the vortex, there is just enough incentive to deviate from the tried and true strategy of always conquering everything and everyone eventually. I’ve really enjoyed the world map this time around with things like colorful jungle and vast deserts breaking up some of the same-y landscapes that were so prevalent in the first game. The art direction, in general, is stronger and shows off more vibrant and interesting designs. Things like corals and flotsam litter the coasts, asking to be explored and tall and dark spires jut out menacingly in corrupted wastelands. It’s a delight to explore and find little details like packs of dinosaurs, billowing fog and magical winds filling up each and every corner of the map. This is by far the prettiest Total War game and I think it uses its Warhammer Fantasy source material in a fantastic fashion. 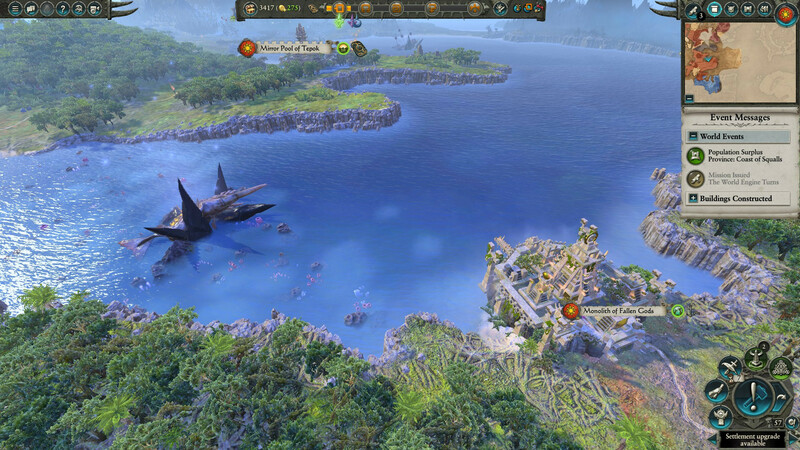 If you own the first Total War: WARHAMMER, you may play on a huge world map that combines the map from both games. Every faction, battle, and unit is in this merged mode and it’s a blast to see all the different factions duke it out for supremacy. World conquest there requires a lot of time and patience but it’s definitely a cool feature to have in the game. I haven’t yet had time to conquer the world for Orkkind but it’s definitely on my to-do list. It should also be noted that the game has great mod support. It’s integrated with the Steam Workshop and there is all sorts of things that lovable Warhammer nerds have cooked up. I’ve had my hands full with the vanilla game but the dozen or so mods that I’ve tested have all worked properly. There’s everything from balance changes to new units and massive total overhauls. I’ve always been a keen mod user (after dozens or hundreds of hours of gameplay I like to mix it up) so it’s great to see that the game has a thriving scene like most other Total War games. From a technical standpoint, this is a rock-solid release. In the several dozen hours of gameplay I experienced no bugs or crashes of any kind. The game performs well on my Ryzen 2700X and RX 480 GPU, hitting mostly 60 FPS or thereabouts with nearly all the eye candy cranked up. There are drops if I zoom in too much in battle or zoom out too much on the strategic map but the game remains playable and, most importantly, stutter free. Despite its shortcomings like the overly simplified systems and mediocre AI, I think that the pair of Warhammer games are among the best in the Total War franchise. The ridiculous factions, the magic and the wide variety of units makes for an entertaining and diverse experience. WARHAMMER II is an addictive experience if you’re into the blend of RTS and TBS that the Total War series is known for and it’s a good entry point for newcomers as well. There’s a lot of fun to be had playing as the cunning rat-like Skaven, the Tolkienesque High Elves and their twisted Dark Elf brethren, or the Mesoamerican-styled Lizardmen. I know that a lot of this review has been dedicated to the weaker parts of the game but that’s just a result of the rest of the gameplay being polished to a brilliant shine. Mechanics from previous titles have been refined and iterated to the point that it’s outright more of a really good thing. There’s other factions available as DLC but I can’t say whether they’re worth it or not as I don’t own these packs. Still, even without the additional content, there’s countless hours of playtime you can squeeze from this title. 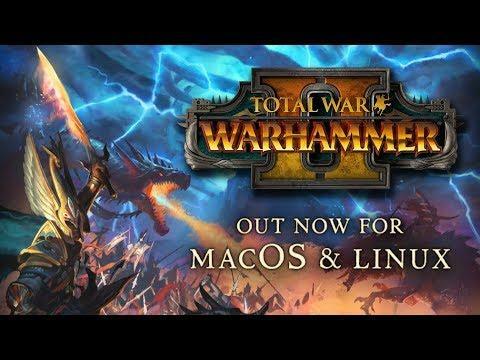 If you’re willing to overlook the rough edges mentioned I mentioned in this review, I think that WARHAMMER II is otherwise one of the most entertaining strategy titles available on Linux. You can get a copy of Total War: WARHAMMER II through Feral Interactive’s Store, the Humble Store or Steam. I've had nothing but smooth sailing - driver issue maybe? I don't use nvidia, but I know there have been some Vulkan problems of late. I'm sure others can chime in. I'm more than impressed with the game personally. Medium settings, no stutter, battles all run smooth, zoomed in or out. Having a blast with the game really. I'm talking about 4k. I could run it with 60fps(with vsync) at 1080p/max settings but it was terribly ugly. It ran poorly on a GTX1080?? Even with the higher resolution, I'm surprised by that. I run my 1080 at 1920x1080, but there isn't a single game I've ever played, native or otherwise that doesn't wildly exceed 60fps. I'm thirding the bewilderment at your poor performance. Liam's own benchmarks on a 980 Ti as well as other people in the comments with varying hardware show that it's working just fine for most people. Maybe it's a driver issue on your end? If you think it isn't, email Feral about it. 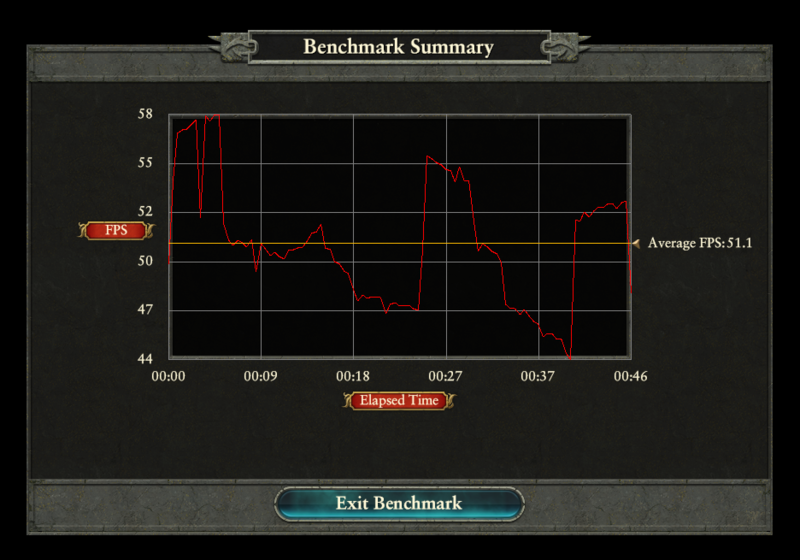 The benchmarks clearly show how poorly TW: W2 performs: 26fps when maxed out. Is it 4k or just 1080p? Because if it's the latter then I'm very unimpressed. lunix I'm talking about 4k. I could run it with 60fps(with vsync) at 1080p/max settings but it was terribly ugly. GTX1080 and 4K...well we have phoronix's benchmarks if you want to compare. Well. That's... quite a statement. Sound very elitist to me, to be completely honest. But hey, maybe you are. I admit I'm not: I play on a 32" Asus Predator 4K monitor at 1080p - a monitor that sits about two feet from my beautifully monitor-tanned face, and I can't tell the difference between a well anti-aliased game running at 1080p and one running at 4K. Actually, I can. Because when I run stuff at 4K, I'm lucky to hit 60fps, even with my GTX1080. But enjoy your 4K, I guess, if you really can sniff your nose at 1080p. If it were me, I wouldn't be complaining about performance though. Ported games will always under-perform compared to their native target. I find that 1080p removes any hint that there's degradation in the first place. And since I just can't tell the difference between that jaggy line and this ever-so-slightly less jaggy line, that's how I roll it. Resolution is set to 2560x1440. SadL Anyone else has issues with the "Blood for the blood god" DLC? I cannot get it to install.. I have it from start and it's working without issue. I didn't bought it, I probably got it because I bought it for TW: Warhammer 1. I cannot remember how I got it. But even though it says I have it, it doesn't install. Whatever I tried failed. Saw other people in steam forums having this issue but can't find a solution that works for me. 1080p is nothing *for a gtx 1080*. Btw, 1080p on a 32" monitor is fine, I' have a 49" TV and 1080p looks very bad on it(unlike 1440p). 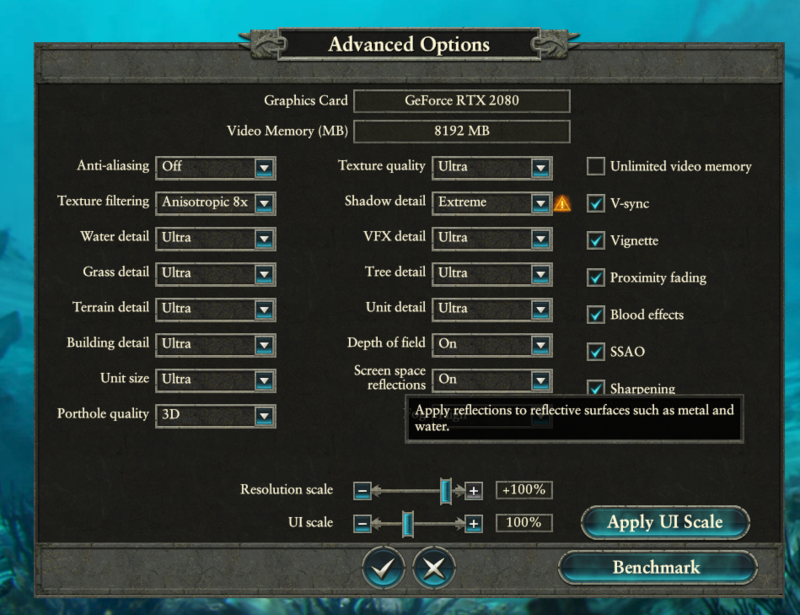 That's why I played the previous tw: warhammer on 1080p in windowed mode. There are people who can't tell the difference between 1080p and 4k. I use my Steam Link on a 4k 49" monitor (which means it's scaling it back to 1080p) but ti looks great, in fact my problem is with some games (tried playing Terraria on it last night) I have to try to scale the UI because I can't read it when I'm laying in bed (the TV is at the foot of the bed, probably about 8 feet away from my head). I purchased the first title but never actually played it due to the lack of cross platform multiplayer support. I want to throw money at Feral & I hear nothing but great things about this game. But as a social gamer, if I do pick up this title, I'll sadly not be using the Linux port. N30N I purchased the first title but never actually played it due to the lack of cross platform multiplayer support. I want to throw money at Feral & I hear nothing but great things about this game. But as a social gamer, if I do pick up this title, I'll sadly not be using the Linux port. Ha, I'm the complete opposite and don't play 'socially' unless it's local-coop, or with my brother, and since he doesn't have a good enough PC, I play PS4 games with him.